Probe Metals Inc. (TSX VENTURE:PRB)(OTCQB:PROBF) ("Probe" or the "Company") is pleased to announce results from an additional nineteen (19) drill holes totaling 6,676 metres on its 100% owned Val-d'Or East project (the "Project") located near Val-d'Or, Quebec. Results include two significant new, shallow, gold discoveries of 7.4 g/t Au over 12.4 metres and 7.8 g/t Au over 2.5 metres located 1,200 and 600 metres south of the former Beliveau Mine, respectively, and represent the furthest step-outs from the New Beliveau deposit to-date. These intervals are associated with new geophysical targets generated along the interpreted mineralized trend and suggest the potential for a much more extensive gold mineralized system than previously thought. In addition to the new zones, drilling also intersected numerous high-grade intervals within the New Beliveau deposit, including 12.3 g/t Au over 8.9 metres, as well as thick, near-surface gold intervals. 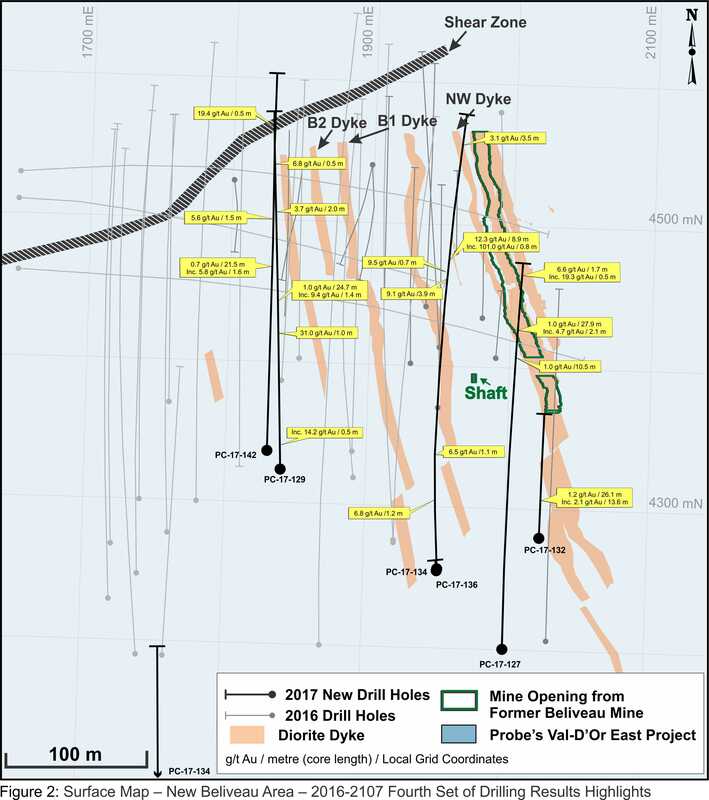 The new discoveries were identified in a recently completed induced polarisation ("IP") geophysical program covering part of the Val-d'Or East property, and represents the first geophysics to ever be undertaken in the area. Mineralization intersected is similar to that observed in the New Beliveau Deposit, and is mainly characterized by sulphide-bearing quartz-tourmaline veins associated with mineralized diorite dykes. Hole PC-17-143 intersected a thick zone of high-grade gold mineralization, returning 7.4 g/t Au over 12.4 metres, within a broader zone of 24.5 metres grading 4.2 g/t Au, at a vertical depth of only 115 metres. The discovery zone is located 1.2 kilometres from the New Beliveau deposit, at the southern limits of the current IP survey. Additional surveys extending further south and east are now underway. 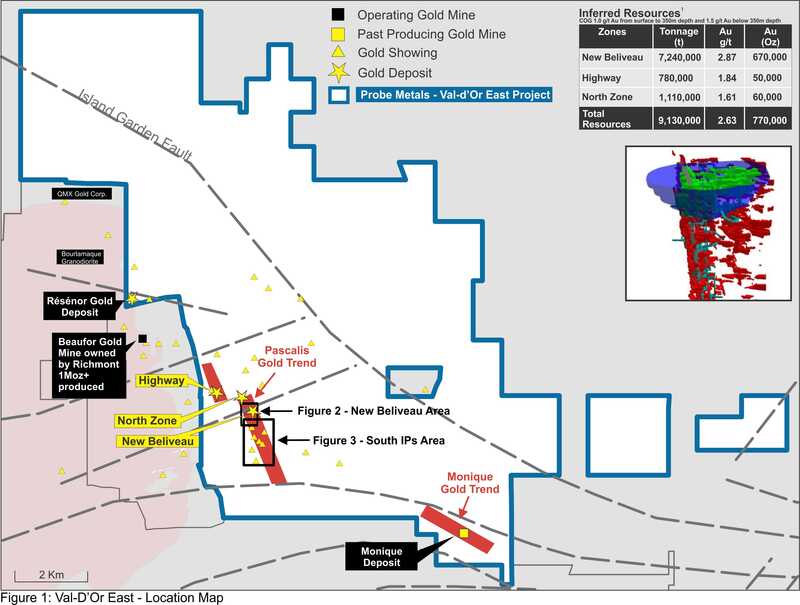 Approximately 600 metres south of the New Beliveau deposit other gold zones were identified in Hole PC-17-137, returning 2.5 metres of 7.8 g/t Au and 11.8 metres of 1.7g/t Au, while Hole PC-17-135 returned a shallow interval of 7.3 metres grading 2.4 g/t Au from 133 metres vertical depth. The multiple discoveries indicate that the mineralizing system associated with New Beliveau may be much more extensive than currently modeled, suggesting an increase in the potential for both open pit and underground resource expansion. 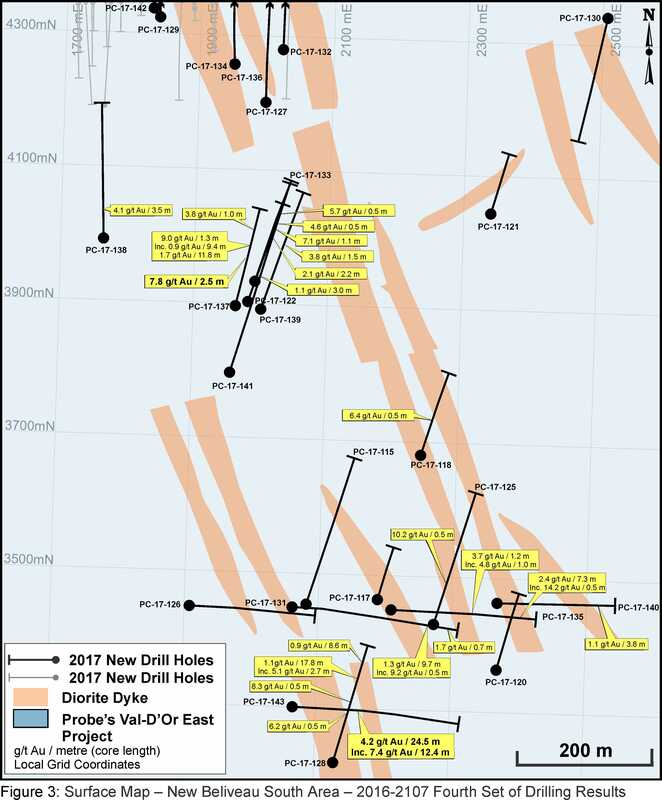 Highlights from the drilling also include holes PC-16-132, and -136, which intersected significant gold mineralization in dyke-structures in and around the New Beliveau gold deposit returning intercepts of 1.2 g/t Au over 26.1 metres, including 13.6 metres of 2.1 g/t Au, and 8.9 metres of 12.3 g/t Au. Assay results from select drill holes are reported in the table below. David Palmer, President and CEO of Probe, states "We are very pleased with the early success of both the resource drilling and geophysical programs. The results continue to confirm and strengthen our belief that New Beliveau is part of a much larger mineralized system with the potential to grow into a significant stand-alone deposit. In addition to the work in, and surrounding, New Beliveau, we are also ramping up exploration on the rest of the Val-d'Or East project for 2017 and see the potential for the same success in these similarly under-explored properties. With 75,000 metres of drilling targeted, we expect to generate significant results on the project before the end of this year." (1) All the new analytical results reported in this release and in this table, are presented in core length. The New Beliveau deposit consists predominantly of a series of parallel, east-west trending, moderately dipping, mineralized zones hosting gold-bearing quartz-pyrite-tourmaline veins. Gold mineralization occurs in the veins but also in their immediate wall rocks. The sulphide content is generally 1 to 5%, but may reach up to 10% in the higher-grade sections. The extent of the alteration zone, which consist of a mixture of quartz, tourmaline, dolomite, albite, and euhedral pyrite is commonly twice the thickness of the vein itself. The north-south-trending diorite dykes also contain significant gold with gold grades typically increasing in areas where the dykes are intersected by the east-west quartz-tourmaline veins. Wall rocks for both systems consist of intermediate volcanics rock. Together with the Highway and North Zones, the New Beliveau Deposit host a NI 43-101 inferred resources of 770,000 ounces at 2.6 g/t gold calculated at a 1.0 g/t cut-off above 350 metres depth and 1.5 g/t cut-off below 350 metres depth (see NI 43-101 technical report: Mineral Resource Val-d'Or East Property - January 4, 2013). During the last drilling program, assay samples were taken from the NQ core and sawed in half, with one-half sent to a certified commercial laboratory and the other half retained for future reference. A strict QA/QC program was applied to all samples; which includes insertion of mineralized standards and blank samples for each batch of 20 samples. The gold analyses were completed by fire-assayed with an atomic absorption finish on 50 grams of materials. Repeats were carried out by fire-assay followed by gravimetric testing on each sample containing 5.0 g/t gold or more. Total gold analyses (Metallic Sieve) were carried out on the samples which presented a great variation of their gold contents or the presence of visible gold. Probe Metals Inc. is a leading Canadian gold exploration company focused on the acquisition, exploration and development of highly prospective gold properties. The Company is well-funded and controls a strategic land package of over 1,000-square-kilometres of exploration ground within some of the most prolific gold belts in Ontario and Quebec: Val d'Or, West Timmins, Casa-Berardi and Detour Quebec. The Company is committed to discovering and developing high-quality gold projects, including its key asset the Val-d'Or East Gold Project. The Company was formed as a result of the sale of Probe Mines Limited to Goldcorp Inc. in 2015. Goldcorp currently owns a 13.8% stake in the Company.